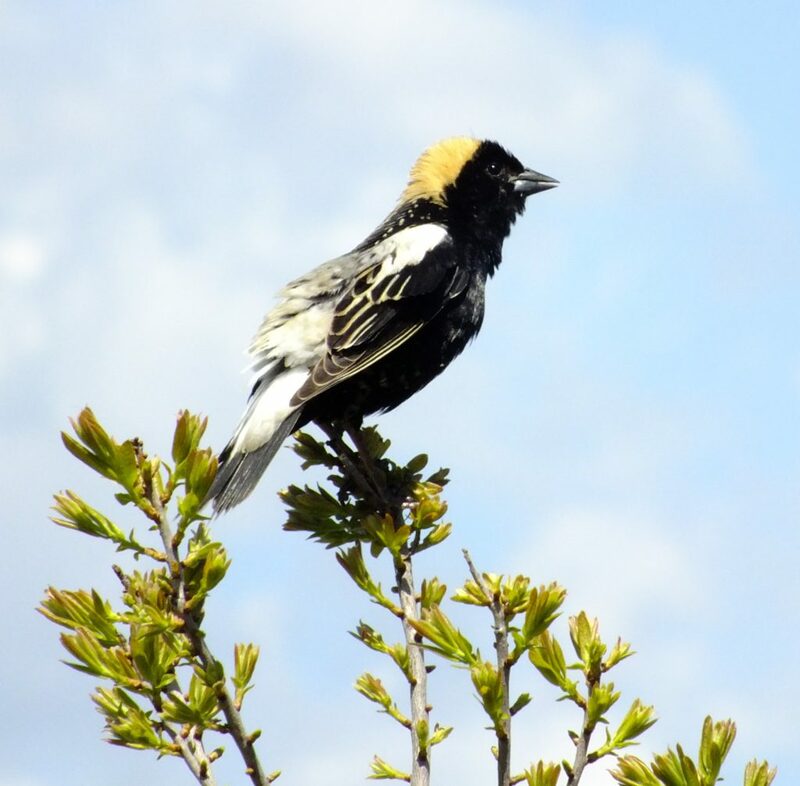 We’re tallying up the results of this year’s Bobolink Project, and the numbers look great! The Project protected 932 acres of nesting habitat, up from 512 acres in 2016 (which was the project’s first year at Mass Audubon). Field surveys showed 368 pairs of Bobolinks on participating farmers’ land. Since Bobolinks fledge an average of 2.79 chicks every season, this translates to saving an estimated 1,027 Bobolinks—many of which may return to nest again next year! Bobolinks rely on grasslands to breed, and often find that hayfields work just as well. Until the mid-20th century, many hayfields were mowed in late summer, weeks after Bobolink chicks had left the nest. Now, high demand for livestock feed means that farmers are mowing earlier and earlier; early-cut hay is richer in protein and more valuable. Sadly, this means that many Bobolink nestlings end up under the mower. 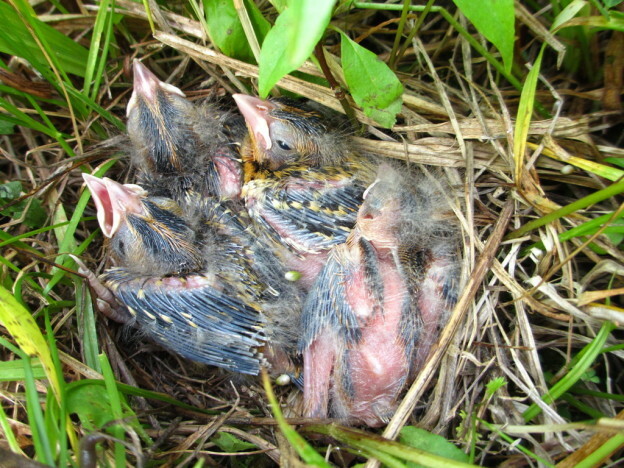 Every year, Mass Audubon offers farmers compensation for waiting to mow their hayfields until after nesting season. This model has so far proved effective: plenty of farmers would rather not mow over active bird nests, but need their hayfields to produce some source of income. Mass Audubon uses donations to cover these farmers’ losses from delaying mowing, keeping their farms economically viable while protecting grassland birds. Even with increased donations, the number of interested farmers is outpacing available funds. This year, we had enough funds to protect two thirds of project applicants’ land. We also had to leave an additional 492 acres of Bobolink habitat on the table. Sadly, this funding gap meant that most fledglings on the unprotected acreage didn’t make it. While it may not be possible to prevent every single agriculture-related Bobolink death across the region, it is painful to have to turn away farmers who want to partner with us to protect birds. If you’d like to help us protect even more acres and Bobolinks next year, please donate here! This entry was posted in Grassland Birds and tagged bobolink conservation, Bobolink Project, grassland bird conservation, grassland birds on September 6, 2018 by William Freedberg. Please be aware that Belle Isle Marsh in East Boston/Winthrop has had successful Bobolink nesting and fledging! Despite the onslaught of jets overhead, the birds have enjoyed the expansive meadow we maintain for them there. That’s wonderful news, Lorene! Thank you for sharing this with us and for maintaining the meadow for the Bobolinks and other creatures. Is it possible for farmers to apply for The Bobolink Project for 2019? How does one go about this? We hay approximately 50 acres in western MA. Hi Julie! The application process for the 2019 Bobolink Project will open in early January 2019. If you join our Bobolink Project e-newsletter list on the website, you’ll receive notice of exactly when it opens. We look forward to seeing your application next year. Thank you for your interest in protecting Bobolinks on your fields! Hi Julie! The application process for the 2019 Bobolink Project season will open in early January 2019. If you sign up for our Bobolink Project e-newsletter on the website, you’ll be notified when it opens. We look forward to seeing your application. Thank you for your interest in protecting Bobolinks on your fields!